If you've done any metal cutting work you understand that a quality plasma system can make the difference in a clean smooth, cut and jagged mess that requires extra clean up time. In this article we're going to review the best plasma cutters on the market. There are two grades of plasma cutting systems. Systems from the big names like Hypertherm, Miller, and Hobart offer equipment designed for heavy-duty daily use. They offer lots of power, high duty-cycles, and efficient use of consumables. Then there are cutters from companies like Primeweld that offer excellent performance using inverter technology. These units are literally a fraction of the cost, and in recent years have come to offer very similar performance. We understand that not everyone is looking for a production grade unit. If you're looking for more budget friendly models, check out our inexpensive plasma cutter reviews. What Other Equipment Will You Need? **Cutting thick steel requires adequate power. For best results, each of these units requires 50A of power from a 230V outlet. For our top 4 we'll be highlighting one model that offers tons of value. Then we'll discuss the best performing models currently for sale on the market. They deliver faster, cleaner cuts, less downtime, and fewer restarts. These cutting systems give you the flexibility to work in any capacity from industrial use to an in-home shop or on the farm. They offer features such as continuous pilot arc, high duty cycles, chew up less consumables, and are more durable than more inexpensive brands. We'll also take a look at a couple more budget friendly models that offer impressive performance and good value for the money. While they aren't tools we'd recommend as the backbone of a business, they can serve well for DIY projects or limited use. ​Each of the models that made our top 3 can handle a heavy workload, cut cleanly through at least 1/2" of steel, and offer reliable performance day in and day out. For the money, the Cut50 from PrimeWeld is one of the best bargains on the market. This inverter-based plasma cutter offers performance beyond even the Powermax45 and at a FRACTION of the price. Got to be a catch right? Not really. PrimeWeld uses the same inverter technology that ​Hypertherm first developed for their cutting systems back in the 1980s. It's capable of consistently cutting 1/2" stainless and 5/8" mild steel and weighs in at only 22.5 lbs. Given it's price point it offers great flexibility as well. There are plenty of powerful plasma cutters out there capable of making short work of thick steel, but not all of them offer the fine level of control to work with thinner materials as well. This makes a great unit for the home shop, farm, or hobbiest. It offers lots of power for thicker materials and the flexibility to work accurately on thinner metals as well. While it offers VERY impressive performance this is not the machine we recommend for someone running a business that requires high performance day-in-day-out. It doesn't offer CNC control, or pilot-arc capability. If pilot-arc is something you need you should check out the PrimeWeld Cut60. ​Let's take a look at it's capabilities. The setup and controls of the Cut50 are pretty standard. You'll want a reasonably good air compressor to ensure proper operation. Don't skimp as it can impact cutting performance. Once you've made all your connections set your amperage based on the material you're going to cut and a way you go. 1/2" mild steel was absolutely no problem for this unit. At 220V it cut through like butter. We didn't change out the power adapter to test 110V performance, but I'd assume you would see a drop off in terms of duty-cycle and you'll most likely need to drop your speed. ​This unit DOES NOT offer pilot-arc technology so you'll need to make contact with the material to start and restart. If you're planning on working with painted, rusted, or perforated metals you'll want to consider a different model that includes pilot arc. While it's tough to gauge reliability in a test, PrimeWeld has a good reputation for a quality product. They offer a very reasonable return/replacement program and are generally very responsive to customer problems or inquiries. If you're in the market for a high-performance plasma cutting system, but don't need a commercial grade product, the Cut50 offers comparable performance to the biggest names in the industry. It's got tons of power, works on both 220V and 110V outlets, and works well on a wide variety of materials. It's not engineered to the same specs as names like Hypertherm, but given it's price point it easily takes first place in terms of value. While the best value cutting system goes to PrimeWeld, the hands-down winner for best performance is the Powermax45 from Hypertherm. Hypertherm's has been building high quality equipment for decades. Their reputation rests solidly on their product's ability to do exactly what they say it will. In that regard the Powermax45 is an absolute beast. This guy can make precise cuts through 1/2" steel at 20 inches per minute all day long. And while it carries a hefty price tag, it's easy on consumables (186% more efficient than some models) which means it's easier on your checkbook over the long haul. As an added perk, Hypetherm's consumables are less expensive than those of many other manufacturers. This is something that should NOT be overlooked if you're operating a business where maintaining profit margins is important. This type of machine was designed to be the backbone of a serious operation. It offers impressive performance, extremely high quality parts, low consumable use and is backed by Hypertherm's incredible customer support network. This is a machine that has 90 engineers and 15 PHD's standing behind it. The user manuals reads like a book and offer instruction for EVERY possible situation from standard cuts to CNC control and operation. If you have a business that requires 100% uptime this is the unit for you. ​Continuous pilot arc - this mode allows you to easily cut perforated metal such as grating. Non-continuous pilot arc - this is the standard setting used for cutting metal plate of varying thickness. The amperage knob allows for quick adjustments to power output. This should be adjusted based on the thickness of the material you intend to cut as well as the ideal distance of the tip from the metal. The arc-torch is comfortable to grip and easy to operate. This should not be overlooked as it makes extended cuts relatively easy on the hands. The unit was designed from the get-go to be portable. While it is the heaviest unit in this comparison, it still only tips the scales at 37lbs. Connecting the gas and torch are quick and easy, meaning you can setup and break down in very little time. While it's tough to gauge reliability in a test, the Powermax series of cutters are popular with professionals for a reason. They are made with quality components and the company backs up their product with impressive customer support. This combined with the unit's overall performance made it a lock for our #1 position. If you're going to drop a couple thousand on a tool you should be able to expect a certain level of performance and reliability. The Powermax45 from Hypertherm was designed from the ground up to be rock-solid. And it says something that Miller uses some of Hypertherm's technology and parts in their cutters. It has ample power, operates efficiently, and offers inexpensive consumables. Cutting 1/2" material at 20 inches per minute, it outperforms all but the higher priced Miller. Miller is another powerhouse when it comes to plasma cutting systems. Like Hypertherm they have built a reputation on solid construction, reliability, and incredible customer service. They also offer wide variety of ﻿welding equipment in addition to cutters. The Spectrum 625 X-treme is a workhorse of a cutter. It's actually rated to cut 5/8" mild steel vs the 1/2" max for the Hypertherm. In terms of build construction and quality it is essentially an industrial quality tool. It even offers both 110V and 220v power so you can use it just about anywhere. It offers much of the same functionality of the Powermax45 including an auto re-fire capability that allows for cutting materials like grates and other perforated metals. It also offers quick and secure attachments for the torch, gas, and power. One very surprising aspect of the 625 is its' size and weight. At only 21 pounds, it is a full 16lbs lighter than the Powermax45. This is largely due to the inverter technology utilized in the 625. If you're looking for a unit that is extremely portable this is a huge plus. The controls and operation of the 625 X-treme are simple and straightforward. It comes with the XT-40 handheld torch, which has been redesigned to be more efficient than previous models with consumables. Miller is another company that has built their reputation on quality. The Extreme-625 is designed to be the workhorse in any shop or factory. They use the highest quality components and have thousands of loyal customers. The Extreme-625 from Miller is a high quality cutter. In terms of power, flexibility and portability this little unit holds it's own against much bigger and heavier units. It packs a powerful punch with a consistent clean cut on 5/8" materials. If you're looking for a high performance machine it's tough to beat. It's designed to be a machine that you can count on day in and day out. Hobart has been in the business of producing quality products for nearly 100 years. Their line of plasma cutters are considered to be some of the best in the industry. ​The AirForce 40i is a highly economical and works on all conductive metals. It is based around inverter technology that is both reliable and efficient. The end result is a highly capable plasma cutting system in a relatively portable package. Capable of cutting up to 5/8″ steel cleanly, this bad boy can tackle just about anything you throw at it. It can even sever up to 7/8″ steel. The duty cycle while cutting 5/8″ material is 50% at 40A, 240V. So as long as you supply it with enough power, it will go all day. The Hobart name is synonymous with quality. Like the Hypertherm and the Miller the 40i is designed to be the workhorse in any shop or factory. They use only the highest quality components and have thousands of loyal customers. Dimensions: 11.25" x 8.25"x 14.25"
With slightly less flexibility, the 40i comes in just behind the Miller. It's slightly larger and requires 240V whereas the Miller can operate on 120V or 220V. Their duty cycles are identical, so if you don't need that flexibility the Hobart will give you basically the same performance at a lower price. They also utilize the same torch so consumables for both will be more expensive than the Hypertherm. While the quality of the Miller, Hypertherm and Hobart are tough to beat, sometimes you just don't need a tool that expensive. In the past few years several lower priced competitors have entered the market. They offer impressive performance and require a SIGNIFICANTLY smaller upfront investment. It's important to understand that these units are not going to offer the same day-in day-out reliability and performance of the higher grade products above, but for smaller jobs and less frequent use they can be an exceptional value. Here are a couple things you should be aware of before purchasing one of these budget models. Service & Support - many of these models are made overseas and will offer little in the way of support. Many WILL replace parts or the entire unit, but they won't offer much help with questions about issues that come up. Lower Quality Components - while many of these units offer similar performance specs as the more expensive models they often include cheaper power supplies, torches, grounding wires, and fan systems. This can lead to performance issues and a shorter overall life. Higher Consumable Use - All plasma cutters chew up consumables, but the less expensive models tend to use them faster. Over several years of heavy use this can even offset the initial savings of buying a cheaper model. If you're using it infrequently this should never be an issue. Businesses Come and Go - Some of the companies making these units haven't been around that long. It's possible they could disappear and you're left with a product that no one will support. This is much more unlikely with Miller, Hypertherm, or Hobart as they have been around for decades. If you’re in the market for a cutter that offers the most bang for the least amount of cash the Ramsond Cut50 DX is worth a look. We were skeptical when this model came out a few years ago as to how such an inexpensive unit would perform. On top of that there were some initial quality control issues. This is the 4th generation of that product and many of these issues have been eliminated by upgrading the internal components. The result is a much more solid and reliable plasma cutting system. In fact of all the inexpensive models currently on the market, the Cut 50DX is the clear winner of best cheap plasma cutter. That's not to say it is on par with ANY of the other units in this comparison. If you need a machine to build your business around, you're better off forking over the extra dough for any of the three listed above. But if you just need something for odd jobs around the house or farm, it's worth giving the Ramsond a shot. The Cut 50DX is simple to setup and operate. The torch is not pilot arc compatible so you'll either need to consistently maintain the appropriate distance or purchase a guide. Cuts on materials up to 3/8" were very clean and quick. At 1/2" we saw noticeable degradation in the cleanliness of cuts. Anything beyond 1/2" and you're probably just looking at a sever cut at best. The unit can be switched between 120V and 220V. We didn't test 120V but would have to assume that cuts made with less power would suffer. Although they use Toshiba for many of their internal parts, the unit doesn't show any sign of being as reliable as the others in this competition. But for about a 1/3 of the price of the Miller or Hypertherm what else could you expect. The warranty on the Cut50 DX is 1 year. Dimensions: 14.2" x 6" x 9"
If you're looking for a cheap plasma cutter the Cut 50DX is worth consideration. This is NOT in the same ballpark as the Hobart, Miller, or Hypertherm and should not be considered for heavy workloads. Cuts at 3/8" and below are clean, but anything thicker and you'll be pushing your luck. If it's for the home or farm this unit has a lot to offer, but for businesses that need a reliable workhorse, it's probably best to go with one of the more robust units. The Lotos CT520D has a lot going for it. It is a 3 in 1 unit that is capable of cutting, tig welding, and stick welding. The unit is substantially larger than the Ramsond weighing in at almost 32 pounds. But with the extra capability this unit provides it can pretty much eliminate 2 tools from your shop. While the maximum cut thickness of 1/2" isn't quite as high as that of the Ramsond, the unit is dual voltage so it can be used with both 110v or 220v. It also incorporates the ability to perform TIG welding which makes it a powerful budget priced tool. The CT520D does require an external air compressor. There is also an available foot petal that can be purchased separately for welding applications. While the performance doesn't match the Ramsond, the fact that it is such a flexible tool definitely justifies the higher price tag. When you take into consideration the fact that it eliminates the need for a tig and stick welder (if you need those) then it is VERY reasonably priced. All of the connections on the unit are quick and straightforward. A longer ground cable would be beneficial and you may wish to consider purchasing this along with the unit. If you're planning on using for welding you'll most likely want to purchase a foot pedal as well. The unit is dual voltage but you have to change the plug to change the voltage. The unit ships with a 220V adapter but you'll need to purchase the 120V should you need it. The cutting performance of this unit is impressive for it's price. We were able to get very clean 1/2" cuts with no difficulty at all. Pilot arc would be a nice feature, but would most likely bump up the price of the unit. TIG welding performance was surprisingly good. The high frequency start works extremely well and the arc is extremely stable. The torch could be a bit better in terms of flexibility, but this is a budget unit after all. If you're going to do DC only welding, this is a great unit. For aluminum you'll need AC and a unit like the AHP will offer more functionality. Lotos makes several different models of plasma cutter. You can read our Lotos LTP5000D review here. As with many of the other products in the budget category you tend to get what you pay for. The CT520D is reliable, but the internal components aren't as well made as those from Miller, Hobart or Hypertherm. This translates to some variance in performance, product life and consumable use. The warranty on the CT520D is 1 year. User Manual. Dimensions: 17" x 8" x 11"
If you're in the market for an inexpensive plasma cutting tool the CT520 offers great flexibility.. As with the Ramsond, it's not in the same league as the Millers and Hobarts. But cuts at 1/2" and below are clean and quick. In this regard it falls a bit behind the Ramsond. On the flip side this unit also offers DC only TIG welding capability. For the price, that combination offers great value. While the cutters listed above are great additions to any shop, sometimes you want something that is more portable. And while all of the models listed above are relatively lightweight and easy to carry around, the Hobart 12ci is the perfect unit when you need something that is both lightweight, compact, and portable. One of the best features of this small plasma cutter is that it does NOT require an air compressor. The 12ci utilizes inverter technology to get the maximum amount of power from it's small footprint. Although it is heavier than the Extreme-625 the built-in air compressor means there is one less piece of equipment you'll be forced to carry around for smaller jobs. It operates on 120V 20A so it will work on any outlet in your home or shop that can supply 20A. The duty cycle is 35% @ 12A and 110 VDC. While the XT12R torch isn't as nice as the XT40R that comes with the big Hobart it is comfortable and more than up to the capabilities of this unit. You can find the torch for sale online if you're looking to upgrade. Here's a quick look at what the Hobart 12ci is capable of cutting. Dimensions: 10" x 7.5" x 13"
The 12ci from Hobart delivers the ultimate in portability and performance. The internal air compressor means one less piece of equipment to haul around. The unit maxes out at 1/8" clean cuts, but if portability and not power is your primary concern you couldn't ask for a more reliable piece. There's no sugar-coating that these are expensive tools, but a higher up-front cost will often translate into better performance and lower cost of operation over the long haul. This is especially important if you rely on your cutter as an asset for your business. Here's a quick look at the models we'll be comparing. When investing this amount of money in a tool it's important to know that it can perform what you'll be asking of it. There are literally dozens of manufacturers and the features and quality of their products vary significantly. Here are a few of the most important features you should consider. Let’s run through them in order of importance. The easiest way to answer this is to ask yourself what type of metal you'll be cutting and how thick it will be. 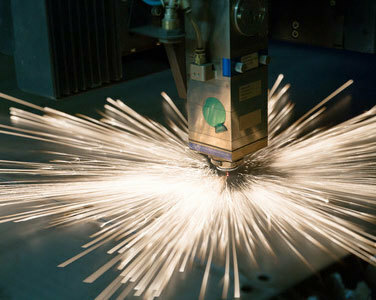 One of the most important considerations when purchasing a plasma cutter is it’s power output. This will ultimately determine how thick of a cut it can make, how long it’s duty cycle is, and how quick and clean the cuts will be. Power output is directly proportional to input power. Some units will work on standard 120V 15Amp outlets (standard in most homes). Others will require at least 20Amps. And the really powerful units will require 220V and upwards of 50Amps. Before making your selection it's important to know what type of power you currently have in your home or shop. ​ You may need to budget for hiring an electrician to get you the necessary power and outlets. Here are some basic guidelines for choosing how powerful your cutter should be. If you’re regularly working with materials that are 1/4″ thick or less then a 25 amp unit should suffice. If you need to cut metals up to 1/2″ thick then you’re going to want a unit with at least 40 amps. And if you regularly work with materials that are up to 1″ thick you’ll want a unit with at least 80 Amps. 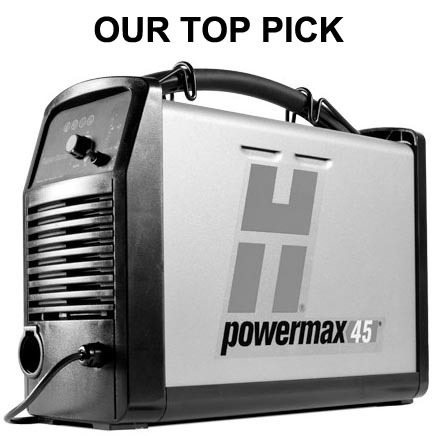 So when making a 1/2" cut that requires 45 amps of power the Powermax45 can run for 30 minutes every hour without overheating. Similarly it can make cuts requiring 41 amps for 36 minutes out of every hour. Cuts requiring 32 amps or less require no cooling time. Consumables are the part of a plasma cutting system that will wear out due to use. 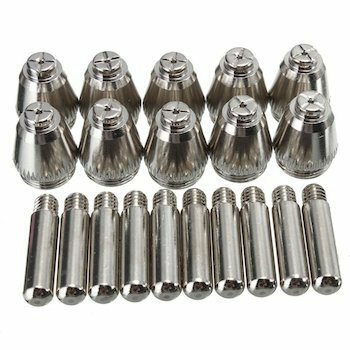 The two that wear the most quickly are the electrode and the nozzle. The temperature of the plasma arc in the torch is roughly 25,000 degrees Fahrenheit. The nozzle is made of copper due to it's superior properties of heat transfer. However, copper melts at 1,100 degrees Fahrenheit. So compressed air is circulated within the nozzle in a way that creates a barrier between the heat of the plasma and the copper, keeping it from melting. The electrode contains hafnium which is extremely efficient at emitting electrons. The high temperatures within the torch eventually cause the hafnium to evaporate. As this happens the torch begins to misfire and the cuts will become less accurate. Handheld torches can be adjusted by the user to make up for this to a certain degree, but CNC consumables must be replaced more quickly to ensure continued accuracy. Here's a ﻿﻿great article detailing all of the necessary consumables in a plasma torch and the role each plays. It's important to consider consumables in your buying decision as they wear out regularly. If one cutter is cheaper than another but requires more regular consumable replacement (or higher priced consumables) you'll end up spending more over the long run. As with the cutting systems themselves, you'll find consumables for sale on Amazon. A great comparison would be the Powermax45 vs the budget-priced Ramsond. While the retail price of the Powermax is more than twice that of the Ramsond, it's efficient use of consumables over the life of using the unit will most likely even out the cost. Most plasma cutting systems come with everything you need minus one component. Pressurized air. With the exception of the models that include their own air compressor, most rely on shop air. The amount of air pressure needed varies based on the manufacturer and model. It's important to understand that air flow is a crucial part of how a plasma cutter works. Clean, high pressure air moving through the nozzle of the torch helps improve the accuracy of the cut and extends the life of the consumables. This Dewalt is a great model﻿﻿﻿ as it is 2 stage and can provide 175PSI. Oil, moisture and dust are the enemies in a compressed air system, and this is no different with plasma cutters. Filtration systems are typically built into the cutter, but the quality of your air compressor still plays an important role. Humidity in the air is another issue since this condenses into moisture when pressurized. It then further condenses as it is released from the compressor. Without getting too technical, just make sure your air compressor meets or exceeds the recommendation of the manufacturer. Otherwise your cuts won't be as clean AND you'll be burning through consumables more quickly. One sure fire way of making sure the air that's feeding into your nozzle is clean and dry is to use a desiccant filter system. These remove moisture and any particulate from the air BEFORE it makes it's way into the torch. These systems are not inexpensive but can pay for themselves relatively quickly because of the money you'll save on consumables. They can also improve the overall accuracy of the cuts. This is crucial in many CNC applications, but obviously makes sense for any type of application where clean and accurate cuts are required. Here is the system we recommend based on our testing. It's a great value for the money. You can find plasma cutters for sale at local welding shops, but one of the best places to look is on Amazon. They have a huge variety of products and you can read reviews that will go into great detail about the capabilities of each unit.